The 2014 season was a mixed bag for Taylor Phinney. Despite superb wins in Dubai, California and the US National Time Trial, his year was ultimately defined by the horrific leg injury sustained in his National Road Race. Phinney crashed into a guard rail while descending at high speed down Lookout Mountain, Tennessee, after trying to avoid a motorcycle marshall. The resulting leg injury was so bad that it had the potential to end his career. Despite this, Phinney remains noticeably upbeat at the BMC winter training camp in Spain, cracking jokes and amusing his fellow teammates during 2015 team photos. CW. When we last spoke to you in September you still didn’t have a full range of motion in your leg, how is the recovery going? TP. It’s going pretty well. I still have a couple of degrees of range of motion that I am not really sure if I will ever get back. It [the accident] chipped off a chunk of my patella so my tendon is shorter than it was before, which I try not to be too OCD about. It’s a long process. At the beginning it was one of those processes where doctors tell you that it’s going to be shorter than it actually is, or maybe that’s what I heard, or the way I interpreted it. It’s like seven months now and it should be a couple more months of general strengthening and making sure I am pain free. CW. Referring to your legs, you previously said you call the broken, skinnier one Chris Froome and the more muscular Andre Greipel. How does the girth of Andre Greipel compare to Chris Froome? TP. I can confirm there is a four centimetre girth differential between Greipy and Froomey. It’s crazy how strong my right leg has become from standing out of chairs largely by itself and walking around (unaided) for the last seven months. I have a way to measure using the leg press and I still have some overall strength to come. The size of the leg will probably always be a little bit smaller, maybe just noticeable to me, but not necessarily noticeable to everybody and that’s just normal with an injury like this. The strength can come back to 90-95 per cent and that’s the main goal for me right now. TP Length is fine! They say it’s mostly about girth though so… that’s what I read on the internet. TP. [Laughs] What is this descending into? It’s the same length. It’s interesting, there was a chance of the length being different, but the way they put the rod in, they did a really good job. I went to a level one trauma centre in Chattanooga, Tennessee, which is the best kind of trauma centre. 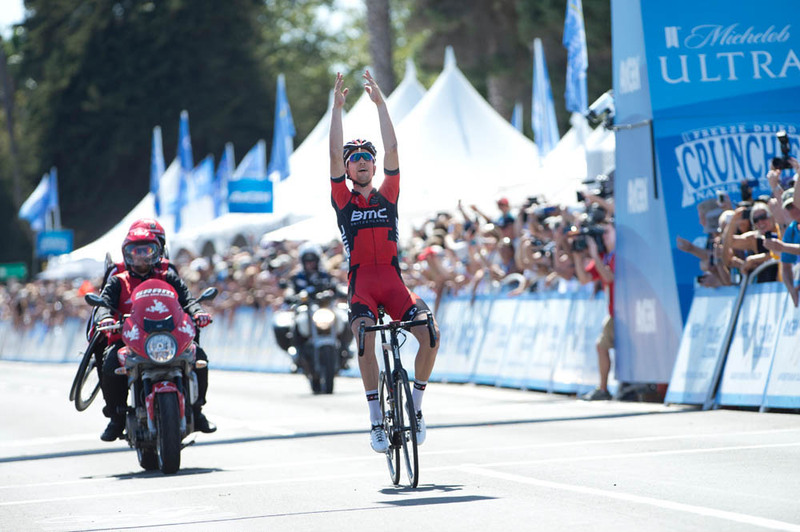 Taylor Phinney wins, Amgen Tour of California, Stage 5 from a solo breakaway. CW. So at this point the idea of racing is still not on the radar? TP. It is, kind of. I thought I just can’t get too carried away thinking about it, I just have to focus on the day to day, getting the strength back and not having any pain. CW. Are you still experiencing pain when you cycle? TP. I can do too much in the gym, or too long of a ride, and the knee will get swollen and be achy. Not excruciating, but things you don’t want to feel. When I think about races, if you had spoken to me three to four months ago I would have talked about going back to Dubai but it’s just been a long process. Realistically, I am looking towards the tour of California in May and that is my big goal and to be training fit, not race fit by the end of March. I will miss the classics, but I did a number on myself. It will be almost an entire year removed, it’s a long time. CW. Have there been psychological scars from your crash? TP. No, I learned from free skiing as a child that when you are doing a jump or a trick and you crash, the first thing you have to do is get up and do the exact same thing again or you will lose it. And it will become something bigger in your mind. On one of the first rides I did outside was way too premature, but I went into this long valley by my house and there is short little climb with a long descent back into town and it is this long descent that I love. I got to the top of this hill and my goal was to do this descent and rip it like normal, otherwise it would turn into something in my mind. Even when I was driving back from Park City during my initial rehab I was driving and finding myself staring at the guardrails, which is what I ran into in the crash. I never had any dreams where a guardrail turned into a monster and came at me, but for sure it was building in my mind. So when I did this descent there was one turn that’s a blind left-hand corner that you can take full gas, but it is scary because it is 80-85kph and you can’t see the end of it, but you know from doing it so many times that you can do it. So I was coming into it telling myself “you just gotta do it, you’ve just gotta do it man” with no brakes and ended upon doing it and got this massive rush. As I was exiting the corner I took my hands off the bars and flicked the guardrail. For me mentally that was what I needed to do. You confront your demons in different ways. Phinney posted this picture of ‘Froomey and Greipy’ on his twitter account. CW. Are you concerned you will never get back to the level you were at? TP. I think there is always that concern, but it wouldn’t be for lack of effort. I’ve put everything into coming back and doing it healthily and sustainably, to the point where I can have a life with an operating limb after my cycling career. I did have to have a conversation with the doctor where he said “Hey, you can push and you can come back, but if you push too hard you can give yourself an arthritic knee for the rest of your life after your early thirties”, so I did have a time where people were saying I should just go back to college. Having to face that at the age of 24, when it’s ‘normal’ unless you are like Jens Voigt, to think about what you are going to do after your cycling career in your mid-thirties… I think it is healthy. I think everyone should have a second plan, but at the same time it can take its toll. But, they say I am ahead of schedule, recovering in a really great way, in a way that I wouldn’t be able to recover if I were much older. Youth is a cool thing. I guess I will understand that in a couple years if I don’t understand it already. I definitely did a lot of things to myself, but I’ve gained a lot over the process as well. CW. Is racing the 2015 World Championships in Richmond a possibility for you? TP. Being in September, Richmond is sure on the radar, but I would like to still make my Tour de France debut. But like I said, I can’t get too carried away about thinking what I am going to do and not do. CW. Longer term, will you be aiming for the Olympics? TP. The Olympics mean a lot to me and are always on my radar. From the day after the time trial in London, Rio has been on the radar. CW. Is the Olympics more special to you because of your parents’ success? TP. I guess so. I think just being raised in America, it is the same as the UK, the Olympics have this huge presence and being a medalist is a huge honour. The most realistic opportunity for me in Rio is the time trial. The road race course looks quite hard, just generally demanding, with cobbles, and steep little sections. You are constantly evolving as a bike rider so I can’t say for sure. CW. There seems to be a rush to do the Hour Record before Wiggins. Would you be scared of doing the hour record after Wiggins has done it? TP. If you do the Hour Record you want to go for the hour record and it shouldn’t matter what the time is already. I think we’re past that point now. Jens did that, there are people coming out every week, the hour record has been around a really long time and I am really happy that it is something that is ‘cool again’. I was initially thinking I would be further on by this point and it would be something I could have done in the early part of next year, but it’s not, so just to have it a month before Wiggins does it? I don’t race for second place. I will consider it down the line, but if I were to do it, it would be later, after Richmond or after the Tour de France. It is not something I can just bang out right now.